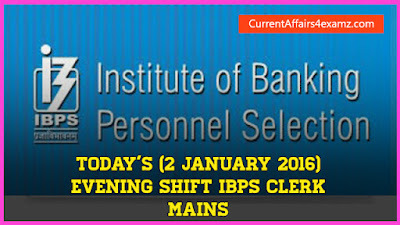 Hi Aspirants..The Evening/Afternoon shift of today's (02.01.16) IBPS Clerk Mains is over now. 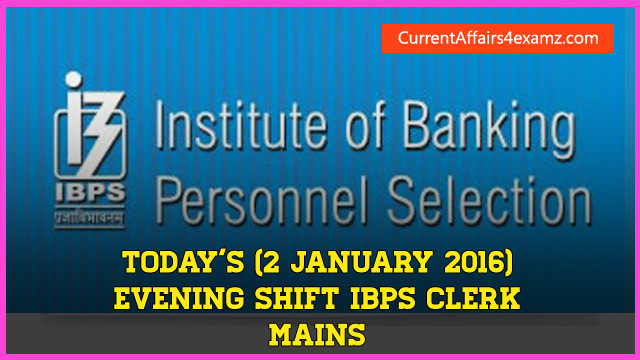 In this post we are sharing with you the questions asked in Evening Shift exam. The Mains Exam consists of Reasoning, English, Quantitative Aptitude, General Awareness & Computer Knowledge. 40 questions from each section for a total of 200 marks. This will be useful for those having exams in upcoming shift & those preparing for next year's exam. 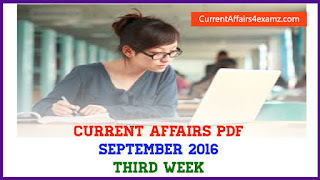 Most of the Current Affairs Questions asked were covered in our weekly Currentaffairs4examz PDF. So if you have upcoming exams don't miss our Weekly PDF. Click Here to download the same.